Gov. Phil Murphy shared highlights on his proposed 2019 budget. After the budget discussion, Gov. Murphy answered questions from the audience. Gov. 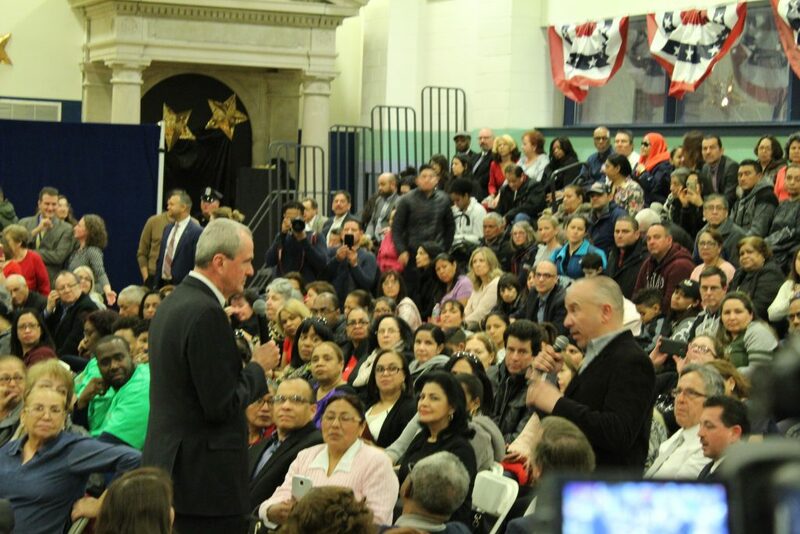 Phil Murphy held a town hall session late last month to introduce Hudson County residents to the second budget he has proposed during his term as governor, which he said was conceived with a stronger middle class in mind. On March 25, at Colin Powell Elementary School in Union City, Murphy outlined a “blueprint for the middle class,” achieved through fiscal responsibility, increased taxes for millionaires, and investments in education, transportation, and workforce development. Murphy said that the prior administration’s budgeting was skewed toward one end of that spectrum. 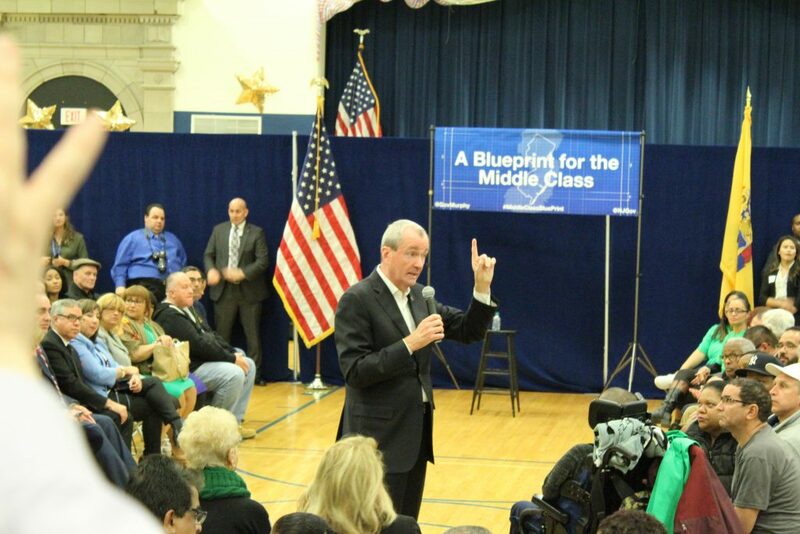 Murphy said that his “blueprint for the middle class” budget is structured around four pillars. Murphy’s targeting a surplus this year of $1.16 billion. Murphy said that this is the most important pillar, especially in terms of education and transportation. Education spending is up in the new proposed budget by more than $200 million. Last year’s budget contributed $350 million more to education funding than Christopher Christie’s final budget as governor. Murphy aims to expand pre-K programs throughout the state, and make community college free, initially for low-income New Jersey residents. Murphy said the fourth pillar may prove crucial to ramping up investments in transportation, education, and infrastructure. “If we’re serious about all-in investment in the middle class, we’ve got to stop making the middle class bear the price of all of it,” Murphy said. He outlined proposed tax reforms. State legislators across the country are also proposing a per-pill tax on opioid sales to fund treatment initiatives for opioid addiction. Murphy backs that idea. “If you’re an opioid manufacturer or distributor, we’re asking you to pay a small per-pill tax to help us fund programs we need to beat back the opioid scourge,” he said. Finally, Murphy announced a proposal similar to last year’s: the millionaire’s tax. Last year’s proposed tax on millionaires was watered down by state legislators. In 2018, what was supposed to be a more than 10 percent income tax rate for those making seven figures became an income tax rate of more than 9 percent for those making $5 million or more. Murphy said he’s still operating with the budgetary aftermath of the Christie administration: budgetary rollbacks on education, transportation, and environmental initiatives, and 11 consecutive state downgrades from credit rating agencies. Murphy anticipates a Department of Environmental Protection energy master plan that will bring New Jersey’s energy infrastructure to 100 percent renewable by 2050. Murphy said that much of the budget, and progress across the state, is contingent on finding compromise with the federal government, despite the apparent gap between Murphy’s administration and that of President Trump. “If you followed my administration every day and saw the actions we took, the time we spent, or the energies we applied, an extraordinary amount of that day is dedicated toward compensating for or mitigating what President Trump is trying to do to the state of New Jersey,” Murphy said. Murphy also touched on Trump’s refusal to help fund the Gateway Tunnel project, a refusal that legislators have dubbed a “ticking time bomb.” Planners at the Regional Plan Association project said that an operational collapse of the only tunnel going into New York City across the Hudson River will be economically devastating for the Northeast. Trump has scrapped an arrangement made under President Obama to construct the tunnel under a 50-50 split between state and federal funding. For updates on this and more check hudsonreporter.com, or follow us on Twitter @hudson_reporter. Mike Montemarano can be reached at mikem@hudsonreporter.com. Officials: Bring back stalled train tunnel project!